Loopallu is a great wee festival that has seen some bands that may surprise you such as Paolo Nutini, Mumford &Sons, Franz Ferdin, The Fratellis and Scouting For Girls. There are also fringe acts around Ullapool. 27 and 28 September 2019. The 19th Festival will take place on the 4th, 5th and 6th of October 2019. 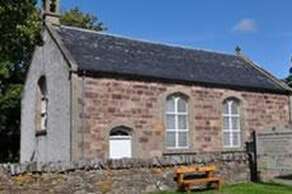 All the concerts will take place in the MacPhail Centre, Mill Street Ullapool. There are events and things happening all throughout the year in and around Ullapool. Here are some other things you might fancy seeing or taking part in. Check ullapool.com events diary for up to date events every week. 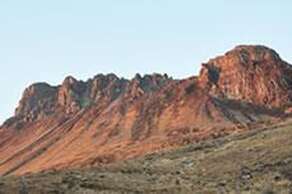 There is an excellent choice of walks in this area, from short strolls to serious mountain walks. Want to bag a few Munro's or Corbett's? - there are plenty to choose from in this area, An Teallach, Beinn Dearg, Beinn More Aaynt, Am Faochagoch being just a few examples. For all your outdoor clothing etc. requirements, visit North West Outdoors, West Argyle St, Ullapool. 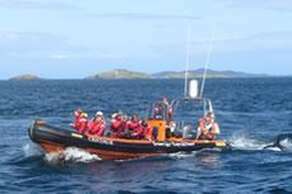 Boat trips are available around the Summer Isles. 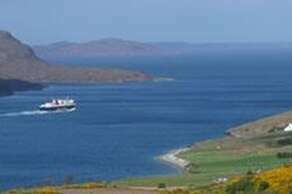 The Summer Queen sails from Ullapool pier, from April to mid-October. The Hectoria, operated by Summer Isles Cruises, sails from Badentarbat pier, Achiltibuie, from late May to October. 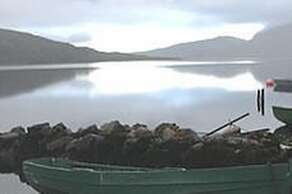 Sea-angling trips are available at Lochinver (tel. 01571 844358) or Gairloch (tel. 01445 712458). Open daily all year (except Christmas &New Year). Swimming pool, badminton &tennis courts, climbing wall, fitness room. The swimming pool offers a wide range of facilities, including a large inflatable for 8-14 year olds, and instruction for beginners. The games hall offers a wide selection of activities from aerobics to volleyball. Staff are happy to arrange whatever there is a demand for. A visit to the award-winning museum is well worthwhile. It is located on West Argyle Street, and is open Monday to Saturday, from 9.30am to 5.30pm, until the end of October (it is also open for appointment in winter). Touch-screens and audio-phones are located around the museum. A taped tour of the town is available for hire from the museum. You can also enjoy a day-trip by ferry to the Isle of Lewis. The sailing time each way is 2 hours 40 minutes. On Mondays, Wednesdays and Fridays between mid-June and late August you can enjoy a day-trip including a coach-tour round the island, for an inclusive fare. This includes the famous Callanish Stones - a huge stone circle that pre-dates Stonehenge. 3 miles east of Ullapool is Leckmelm Garden, a pleasant 19th-century arboretum - there is car-parking within the garden. Lael Forest Gardens, 9-10 miles east of, Ullapool, offer pleasant woodland walks of up to an hour. The trails start from three car-parks, well signposted. Corrieshalloch Gorge, 12 miles east of Ullapool, is well worth a visit;from the roadside car-park a footpath leads to a viewpoint and a suspension bridge above the Falls. North of Ullapool, Knockan Crag (12 miles) is a geological landmark with superb way-marked trails and an interpretive centre. 25 miles north is the ancient and picturesque ruin of Ardvreck Castle. Isle Martin is a picturesque island some 3 miles north of Ullapool, owned by a local trust. Trips are available in July and August on Wednesday evenings and on Saturdays. Stay in the croft house on Isle Martin, details Sheila Didcock 01854 612937. Isle Martin History Walks and Talks - dates to be announced soon. Ullapool Golf Club is at the northern end of the village. The nine-hole course opened in 1998 and is set in a beautiful location, with a challenging mix of seaside and moorland. Club and trolley hire are available. Deer-stalking is available on estates including Leckmelm (tel/fax 01854 612471, email leckmelmestate@aol.com) and Rhidorroch (01854 612548, email rhidorroch@btinternet.com). Seals can be seen all round the coastline - including at the harbour in Ullapool. In the wider area, red deer are abundant. Otters and wildcat are harder to glimpse - but you never know! You may also see eagles, sea-eagles, divers and other rare bird species (please ask for a wildlife leaflet at the TIC). An enjoyable off-road cycle route is through Rhidorroch estate east of Ullapool, as far as Loch an Daimh (20 miles total, there &back). There are also enjoyable waymarked cycle routes in Inverlael Forest, near the head of Loch Broom. Please ask at Ullapool TIC for a factsheet about bike routes. One of many popular routes for a day-trip is north to Coigach or Lochinver, perhaps continuing to Durness on the north coast. Another fine drive is via Dundonnell to the Gairloch district and, a little further (if you have time), to the superb scenery of Torridon. A bus service departs from Ullapool for Achiltibuie, 25 miles north-west. This makes an enjoyable half-day outing through fine scenery. From May to September, a bus service operates to Lochinver and Durness on the north coast, Monday to Saturday. There is a good adventure playground at Morefield as well as two smaller playgrounds in the centre of Ullapool. Bridge House Art in Ullapool has an excellent reputation for its art courses, which vary from a weekend to one-week and longer. Contact Eleanor White, tel. 01854 612281. Ullapool Pipe Band and Highland Dancers give a weekly display on Thursday evenings in the ferry car-park opposite the pier, from mid-June to early September. 'Ceilidhs' or concerts and other arts events, are held throughout the year at venues including Ullapool Village Hall, the MacPhail Centre, the Seaforth Inn and the Ceilidh Place Clubhouse. The Coigach Gathering, with displays of piping and dancing and traditional Highland games, takes place at Achiltibuie, 25 miles north-west of Ullapool, in late June or early July. 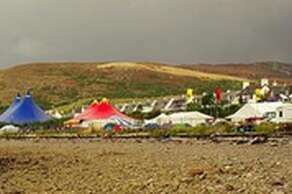 Assynt Highland Games is held in August at Lochinver, 37 miles north of Ullapool. Well worth a visit, whether to buy or just see the potter's at work, Highland Stoneware's pottery on North Road is open all year except during the Christmas / New Year fortnight when it is closed. Literature has a significant place in Highland culture and life. 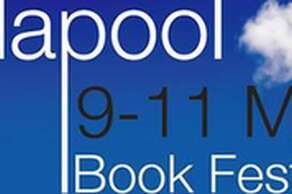 The Ullapool Book Festival is not just a showcase for Highland writers but also for writers from other parts of Scotland, and indeed the world, to come and create an inspirational atmosphere. There will be workshops, open talks and discussions. 2019 is the fifteenth book festival and promoses to be another great one. 10th to 12th May.